Over time I have made a few changes to the recipe. I usually add in some andouille sausage if I have some around. The spicy sausage really adds to the depth of flavor in this dish. I also usually use yellow and red bell peppers instead of green because that what I keep around. I also will often use pre-cooked rice that I keep on-hand in the fridge and that cuts the cooking time considerably. I also add considerably more than 1/8 teaspoon of Cajun Seasoning. We like things spicy around here! My oldest son actually says this is his favorite thing that I make. Enjoy! Recipe from The South Beach Diet Quick and Easy Cookbook by Arthur Agatston, M.D. Season chicken with salt and pepper. Heat 1 tablespoon of oil in a large straight-sided skillet over medium-high heat. Add chicken, scallions, bell pepper and garlic; cook, stirring often, until vegetables are softened, about 5 minutes. Stir in rice and Cajun seasoning. Add broth and tomatoes with juice and bring to a boil. Reduce heat to medium low, cover, and simmer, stirring occasionally, until most of the liquid is absorbed, about 30 minutes. 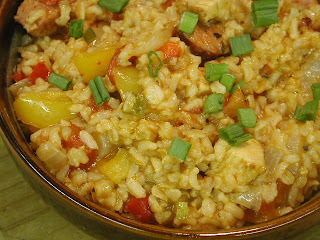 If jambalaya has excess moisture, cook uncovered for 3 to 5 minutes. Sprinkle with reserved scallions and serve. If you use quick make brown rice, do you still simmer for 30 minutes? We make it all the time in the colder months. Friends and family beg for it when they know we have made it.